Eric reviews Jazz Fest 2014. On the Dissent website this week, Jeff Faux and I responded to Michael Walzer’s attempt to articulate a “left” foreign policy position. You can read that here. I assume my Nation column is still behind a paywall, but maybe not, depending on when you read this. It’s called “Obama’s Pundit Problem,” with the subhed: “Critics like Maureen Dowd of the Times live in an Oz-like dream world.” You can (maybe) read it here. The secret to having a great time at Jazz Fest, in this man’s opinion, is to spend as much time as possible inside the tents: gospel, blues and especially jazz whenever possible. Outside in the sun, people tend to drink a lot and not pay too much attention to the music. Also this week was really hot. Inside the tents, they have chairs, a lovely soft mist coming from the roof, a carpet on part of the floor to soak up the echoes and people who are paying attention. I caught a few minutes of the end of Cowboy Mouth’s set. They were horrible. Sadly, I did not see as much of Sanders as I might have because I had invested in Charles Bradley in the Blues Tent. Charles, who is sixty-five years old, puts on a show that draws heavily on the old James Brown/Wilson Pickett/Otis Redding school of performance, which makes sense because he is their peer, and he did not get a chance to enjoy himself as a soul star for much of his life which has been no picnic, I’m telling you. He was ok, but the songs and the screaming and the sweat ran together. Also, maybe this is my fault, but I found it weird that his whole band was white. I caught part of a blues tent set by the Joe Krown Trio featuring Walter “Wolfman” Washington and Russell Batiste, Jr. They were also ok. Then, to try to get a decent spot for Bruce, I headed over to the big stage to see the set before his, the Voice of the Wetlands Allstars. They were pretty fun. How was Bruce, you ask? Well, they do love Bruce in New Orleans ever since his apparently amazing post-Katrina appearance when the festival almost didn’t happen. I saw him two years ago and it was a wonderful performance and it was crazy crowded, but since it was the first weekend and a Sunday night, well, it was not nearly as crowded as it could be. This was not true this year, which was on a Saturday night, second weekend, and the most crowded place I’ve ever been, outside a subway. On Sunday, I had one of those discoveries that makes Jazz Fest such a treat: something called “James Andrews and the Crescent City All Stars.” I don’t know a thing about them except how much fun they were (in the blues tent again) and also that Mr. Andrews’s wife had pipes that amazed everyone during her tribute to Etta James. The way people reacted reminds you that you go to see the big acts but it’s the people you never heard of that make it so memorable. One moment you were just sitting there; the next it was a joyful celebration of life. Though they often get a bad rap at Jazz Fest, the big bands do tend to rise to the occasion. I’ve never seen The Arcade Fire before, but they are pretty much the only newish band I really like. (Though Lake Street Dive has real potential.) They were closing out their “Reflektor” world tour and were wonderful. They entered the big stage in a conga line dancing to "Iko Iko," followed by a second line of dancers in enormous papier-mâché masks that included the current and few ex-presidents, Pope John Paul, all of whom appeared to enjoy "Here Comes the Night Time (Part I). In a too short ninety-minute set, we got "Here Comes The Night Time," a rendition of "Neighborhood No. 3 (Power Out)," "Rebellion (Lies)," and “Funeral.” Next Win Butler announced, correctly, "This is one of the last places in America that's its own place, but for the rest of us, there's this song,” as the band launched into "The Suburbs." Given that it was Sunday and the field was not nearly so crowded as the day before, I found people paying a lot more attention to the band than they had the day before. There were no loud drunks or stupid wisecracks; just a lot of singing and dancing to some wonderful music. As the show ended, the band walked into the crowd joined by the Pinettes Brass to ”Iko Iko” once again. Boy were they fun. 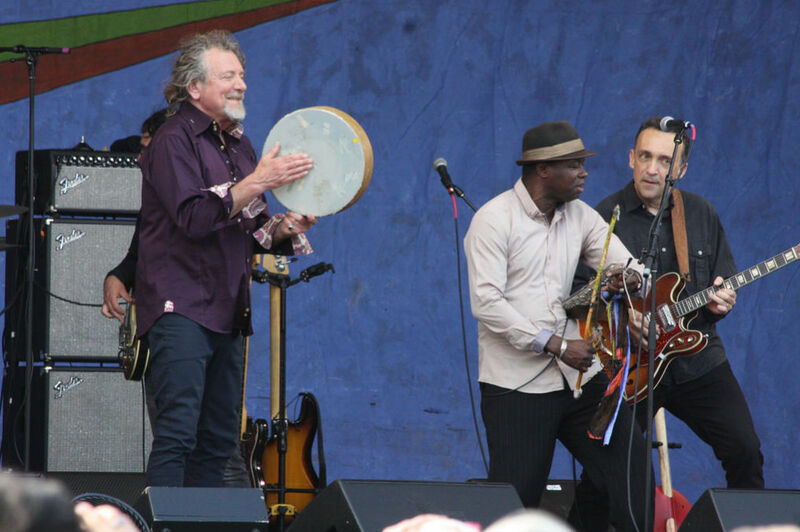 Together with Alejandro Escovedo and Lyle Lovett, neither of whom I saw owing to my traffic accident, Robert Earl Keen held up the Texas end of things. "What could be better than good food, good drink and good weather?" How about a new version of the Dead's "New Speedway Boogie?” Plus a really long closer beginning with those immortal words: "Sherry was a waitress at the only joint in town/She had a reputation as a girl who'd been around" Pretty great, and I wish I heard more. But The Arcade Fire and scheduling did not permit. How great is Jazz Fest? To see TAF and a little bit of Robert Earl Keen, I had to skip Chick Corea and the Radiators and Bobby Womack. Aaron played the king of seventies set that Rod Stewart would sing if he had better taste. In addition to the above, we got "What's Going On?" "Ain't No Sunshine," "A Change Is Gonna Come," plus "Three Little Birds" and "Stir It Up." Jason Neville showed up to sing "Hercules" and "Give Me the Beat Boys," which was followed by “Sara Smile,” "Down by the Riverside," and "When the Saints Go Marching In," which sounded a lot different than the way Bruce played it. He closed with a bone-chilling "Louisiana 1927," which would have been a great closer. But he came back as he has every show for the past fifty or so years to "Tell It Like It Is," and stuck around for an a cappella version of "Amazing Grace," and sent everybody home with "One Love," with Cyril Neville showing up to sing along. I had planned to include Charles Bittner’s photography in my coverage, but it turned out that his camera equipment did not survive my car crash—something we did not learn until it was too late. Almost everything that could have gone wrong did for me this year, and yet I still am very much looking forward to coming back next year. Jazz Fest is a national treasure. I’ve talked only about the music but of course the food was wonderful and amazing and the people, without exception, incredibly friendly and helpful and there was lots of stuff to buy that you almost certainly couldn’t buy anywhere else. Jazz Fest is heavy on corporate sponsorship (Shell, Acura, Samsung) but it wears it pretty lightly. Nowhere else do you see so much of the best of this country’s culture on display in one place. It’s enough to make a patriot out of you. Last night I went to 92 Street Y for a long-postponed evening with Claudia Roth Pierpont, Nicola Krauss and the man himself in honor of Pierpont’s book, Roth Unbound. Pierpont gave a clever talk about the role of music, silverware and, um, women in his work. It was a brilliant defense and should make all those people who complain about alleged misogyny in his work feel silly, but of course it won’t. Nothing will. Ms. Krauss gave a long, personal, deeply heartfelt introduction, which was quite moving and then Roth read two long sections from Sabbath’s Theater. This was really something. Sabbath has always been among my least favorite of his later works, especially among those that everyone thinks is great. (I am also not a fan of The Plot Against America.) Anyway, the sections Roth read—none of the dirty parts—were so beautifully rendered and simultaneously true and poetic and powerful, I was left speechless. The other point that needs mentioning is how beloved and respected Roth has become among American Jews. It’s so deeply ironic that I need to write a book in which it is a major theme… and so I better stop writing this right now.